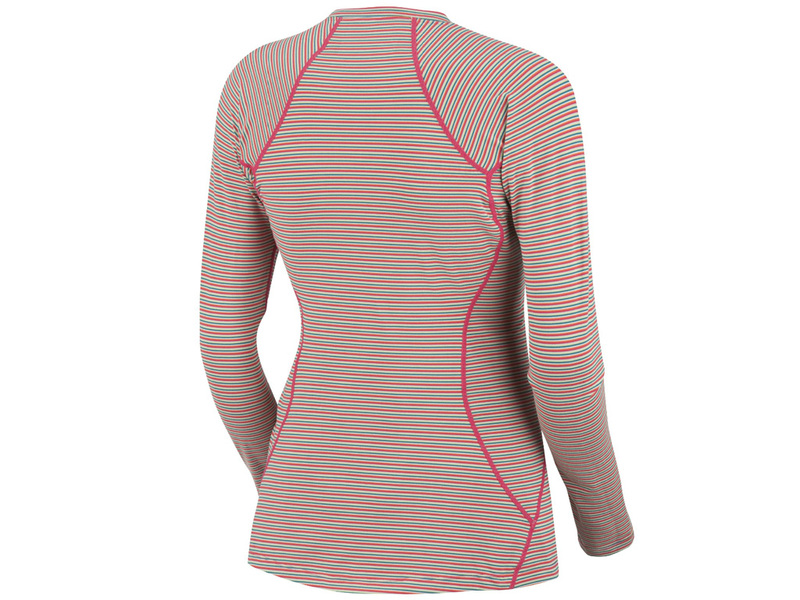 The Columbia sportswear Women’s base layer midweight stripe top is a relative new-comer is Columbia’s base layer line. It features Omni-Heat® thermal reflective dots for strategic warmth, Omni-Wick™ advanced evaporation fabric in high-moisture areas, and an antimicrobial treatment to keep the garment fresh. The 4-way stretch fabric is designed with flat lock, ergonomic seams to reduce chafe and increase range of motion during active pursuits. Center Back Length (sz XS): 25in. 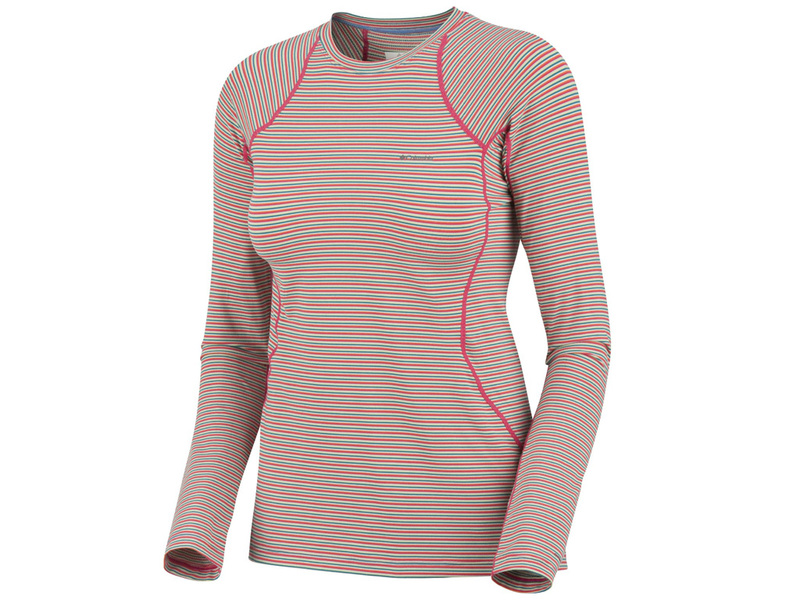 The Columbia Women’s Base Layer Midweight Stripe Top feels soft and lightweight at first touch. The fabric is quite stretchy, allowing it to have a form-fitting, but unrestrictive feel. The Omni-heat® thermal reflective dots on the inner surface of the fabric helps reduce bulk while maintaining critical warmth. These dots are deliberately absent in high-moisture areas, replaced by Omni-wick™ advanced evaporation fabric (on the sides of the torso or armpits). The garment features flat lock seams throughout and a simple fabric crew neck. When I first saw the Columbia base layer midweight striped top, I thought an XS might actually be too snug for me. However, due to the 4-way stretch material used in its construction, the base layer was form-fitting without feeling uncomfortable. It was obvious that this top had been designed with active pursuits in mind. The flat lock seams curve nicely around the arm pit - rather than right up to it as with traditionally-seamed tops - protecting this area from seam-induced chafing. The top warmed my core quickly after wearing it for a few minutes around the house. Based on these initial findings, I am excited to put these to a real test on our next snow adventure. My first time wearing the Columbia base layer midweight stripe top was on a snowmobiling adventure to Clear Lake Lookout. I wore the base layer top under my Columbia Alpine Alliance Parka. The temperature was in the low 30's F while wearing the top. Usually when snowmobiling or at rest during a snow shoeing trip, my arms and eventually my back become cold due to a buildup of air-cooled perspiration. This causes me to become cold and shivering in a matter of minutes. However, on this trip my core remained quite warm with the midweight top against my skin. Though I was exerting myself while repeatedly digging our snowmobiles out of the deep powder, I did not get cold while riding, likely because sweat was more effectively wicked away from my skin instead of trapped against it. As we drove home that afternoon, I noticed that my back was not as cold as usual because it was not soaked with perspiration. When we finally arrived at the lookout tower the next day, I became quite cold in a matter of minutes. As Jason got a roaring fire going, I noticed that my back and chest were wet with perspiration, unlike the previous day. The difference today? I had chosen not to wear my Columbia midweight base layer top. Thinking I could get away with only one base layer top, I stupidly left it at home. Sitting by the fire trying to dry my other top, I wished I had my midweight base layer top. I suspect it would have done a better job wicking moisture away from my skin, allowing it (and me) to dry quicker. Overall, the Columbia base layer midweight striped top seems to be a good performer for cold weather and active pursuits. I am excited to continue using the top this winter. I suspect the similar midweight zip top in this same base layer lineup is also an excellent choice, as its zippered front allows even more temperature regulation. 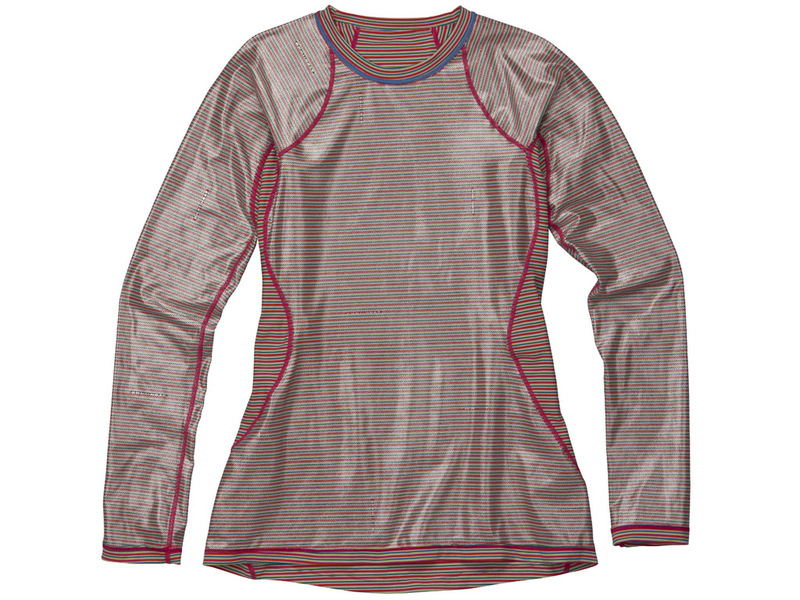 See Clear Lake Lookout adventure where the Columbia Women's Base Layer Midweight Stripe Top was used. Special thanks to Columbia Sportswear for providing the Baselayer Midweight Long Sleeve Stripe Top for review.